Tag Archive | "Rainbow Shark (Epalzeorhynchos frenatus)"
The Rainbow Shark (Epalzeorhynchos frenatus) is a popular semi aggressive aquarium species known to tropical fish keeping enthusiasts as the Ruby Shark, Red-Finned Shark, Red-Fin Shark, Rainbow Sharkminnow, Green Fringelip Labeo, Whitefin Shark and Whitetail Sharkminnow. Rainbow Sharks are native to the Mekong, Chao Phraya, Xe Bangfai and Maeklong river basins in Indochina where they are most commonly found over sandy substrates along the bottom of rivers. The Rainbow Shark is a beautifully colored fish that has an elongated dark blue gray to black body, or a bright blue body and red, to orange red fins with a pointed snout. The abdominal area is flat, and there is a short dark stripe that starts at the mouth of the fish, goes through the eye and ends at the gill cover. Their colors become more intense as they mature. 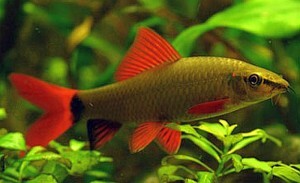 There is a well known color variation of the Rainbow Shark called the Albino Red Fin Shark or Albino Rainbow Sharkminnow. 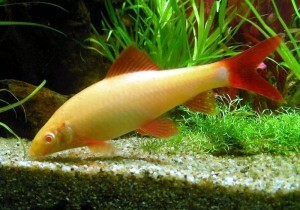 This variant has a white body and red to orange fins and is almost identical to the Rainbow Shark in temperament and appearance. Male Rainbow Sharks have thinner bodies than the females, black lines along the tailfins, and are more vividly colored. Epalzeorhynchos munense is a separate species that rarely enters the aquarium trade and is commonly confused with the Rainbow Shark (Epalzeorhynchos frenatus). The Rainbow Shark is great for a semi-aggressive community aquarium, provided they are the only shark in the tank, and their tankmates are of similar size. 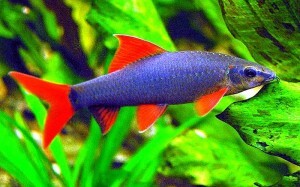 Rainbow sharks are compatible with Barbs, Rainbowfish, Danios, Loaches, Plecos, Rasboras, and Gouramis. They are not compatible with smaller, more timid fish which they will dominate and terrorize. Rainbow Sharks are best housed in a densely planted aquarium of at least 55 gallons, with a sandy or fine gravel substrate, rocks, some driftwood , and plenty of swimming space. Sharks will usually stake out territories in an aquarium and become very aggressive towards others of their own species. Rainbow Sharks are egg layers and although large quantitie are commercially bred in Southeast Asian fish farms, no breedings have been documented in an aquarium environment. In their natural habitat, Rainbow Shark are omnivores that feed on algae and plankton along sandy river bottoms. They migrate into flooded areas during the rainy seasons and back into the rivers as the floods recede. In an aquarium environment, they are not picky eaters and will readily accept flake foods as well as live, frozen, or freeze dried bloodworms , tubifex , and vegetable based foods. The Rainbow Shark is readily available to tropical fish keeping enthusiasts at an approximate purchase size of 1-1/4″ to 2″.